It fits in the palm of my hand, small and pleasing, like Julian of Norwich’s hazelnut. The cover is cut and glued from scrap paper – the same paper that lines my kitchen cabinet. The pages, cut from printer paper and the binding, a bit of linen cord. All in all, it took less than fifteen minutes to complete once I understood the pattern and got my measurements right – in fact, I made two. Inside I wrote, by hand, one of my own small poems, fifteen lines spread across nine pages, forty words in all. I wrote a book, see? Because that’s what I’ve wanted to do for a long time now and yet I’ve been afraid, overwhelmed by the enormity of it, unsure where and how to begin. So I followed my heart to its place of joy – a quiet place where words and pages meet, where a project is small enough, simple enough to be approached. My love for craft – paper, glue, scissors, color and cord – balanced out my fear, tipping me toward productivity. I wrote a book, a very small one indeed. I was smiling inside and out, delighted in a heart-happy way as I moved about the house. Then my mind kicked in – not the mind that is restful, awake and aware, but the calculating one, the insatiable. Before long I was making books by the hundreds, selling them by the truckload, considering buying a printing press – in my head. And there, of course, the fear set it, what if it didn’t work? What if it wasn’t a huge success? What if this little joy couldn’t sustain its own multiplication? Pea-green paper rested between my fingers. Linen thread wrestled. The tiny triangular tab of a cover tucked perfectly into its slot. No, I thought, it wouldn't be any fuller. That’s not how joy is. Joy isn't a commodity that changes with increase, it's whole in and of itself, like a ripe berry, or small seed. Joy needs no addition, no subtraction or multiplication. Joy can be shared, spread, multiplied, but only as itself, each experience whole like the many seeds of a pomegranate’s flesh. That question rooted me back in the present, gave me back the joy that arrived like a rainbow, a gift, to begin with. There will be more books, in many sizes and with them each will come joy. But it won't be any more or less than what I held that day in my heart’s hands - pure, simple, sweet. Is there some small thing that's giving you joy these days? I'd love to hear about it in the comments. Beautiful post. I am learning more & more, it is often the small things which are truly the big things. We just don't see it at the time :) Kelly, I am always blessed to join you! Thanks for being here, Joanne. I love this post about your small book and the joy it gives you . This summer I am finding joy in the times that my boys and my husband and I are all together. Nothing exciting, but sitting around a fire or eating a meal together is just a gift, and I'm thankful when it works out. Oh, how I love this, Kelly. You wrote a book. I should count that accomplishment myself as well. I'm keeping a journal for 8 weeks while my daughter has been in Guatemala. It's a book too! "Joy isn't a commodity that changes with increase, it's whole in and of itself." Truth! Thank you. Staying in the moment....there is joy here. Oh, I do hope we get to hear more about your perspective on her time away. Thanks for being part of this community, Lisa! First, I had to read about Julian of Norwich and her hazlenut - which warmed my heart! Then I read about your hazlenut - your little book and the joy of it - and it warmed my heart, too! Beautiful truth shared, Kelly! Praying each book give you equal measure of joy! Right now - one of my joys - is the hum of my boys moving in the house. It's like Grande Central Station right now - some just dropping in for a few months, some transitioning and some still in the nest - and the conversation in each passing warms my heart, the joy of prayers answered! Ah, Julian of Norwich, she has become a heart-friend of mine. I'm so glad you're enjoying this time with your boys - it is precious, indeed. I love this! Such a fun way to pursue your creativity in the day-to-day. Thanks for hosting! I hope y'all have a great week! Thanks, Lauren. I'm finding that tangible things really help to ground me. What small moments bring me joy? I got to wander out on our deck this morning to follow the 'clack clack clack'ing of a pileated woodpecker, whose red plumed visage I attempted to capture with my camera. In the greenbelt behind my house. Just there....for me. God is so wonderful like that. And your little green book? You inspire! 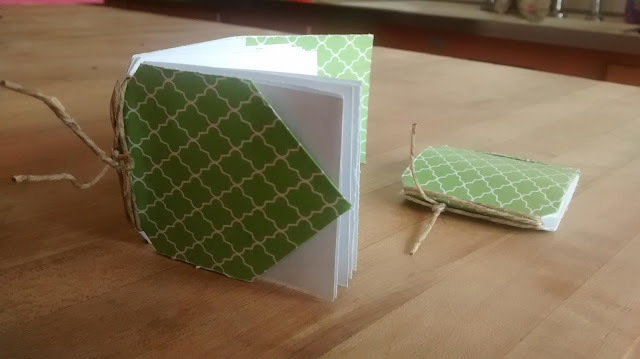 I made a similar foldable book during our crafts time at the Women's Retreat we had last month....It's blank inside--I think I'll fill it with a poem or two! "Joy needs no addition, no subtraction or multiplication. Joy can be shared, spread, multiplied, but only as itself, each experience whole like the many seeds of a pomegranate’s flesh." Next time I see a pomegranate, I will think of that. I hope you enjoy writing in your book, Jody, and find that your own "clack clack clacking" words are enough. Hi Kelly! (I won't try your last name that I can't spell or say.) It's worse than mine! I really enjoyed your book, and hope you'll write lots of them. I loved the way you found such joy in it. My daughter often says we homemakers find joy in the craziest things, and I think she's right! My little joy today was seeing my first ever lizard eggs! (The lizard should be Italy's national animal there are so many!) But we've never found the cute tiny eggs until today. I like lizards. They're interesting. And the eat bugs and the dreaded spiders! Before I go, I want to thank you for this lovely link-up! I love spotting unexpected joy--so I think it will be lots of fun! Thank you for your generous hospitality, and your lovely, encouraging blog! Wow, Lizard eggs - what do they look like? Leathery? And I wonder what color? We found some broken robin's egg shells today and I couldn't believe how very blue they were. Thanks for joining us, Sheila. How do you learn to hand letter, Karrilee? I've been making paintings that include words, but using stencils because I don't trust my lettering. Maybe I need to look into it online. I just remembered the other day how I learned to do calligraphy as a kid. So many things to explore! Thanks for being here, Karrilee. This is so purely beautiful, Kelly. I, too, have been struggling with the enormity of writing a book, and so this - how you started with something small and it so filled you with a joy and satisfaction - moves me. Your words are chock full of wisdom and I know I'll be returning to them. I'm so proud of you for this book. May you continue to know its joy, and others, as they come to you. Yes, a book, is such a BIG thing! But even the best books are made of many, many small words and thoughts strung together. I'm trying to trust that acquainting myself with the small will bear fruit. I found joy in your small book, too. And in your words mingling together until I thought I held it in my own hands. We need reminded what joy is all about sometimes. It's not the big, but the small that makes it so precious. I'm finding joy in letter--mailbox real letters--envelopes unique from my husband's pen. I write -- he draws and then we feed the mailbox. Oh, letters are such a concrete joy, I'm glad you're feeding that box - someone on the other end is hungry to receive that love, I'm sure. Thanks for being here, Pamela. i'm new here today. i love your little book! i too am a crafter and have been asked to make duplicates of project to sell...and i never accept. for the exact reason that "my joy won't be fuller" if i make more. it's the heart behind the original,ya know? anyway...glad to have stopped by today.